This article is about the NFL placekicker. For the similarly named retired running back, see Josh Scobey. Josh Scobee during his tenure with the Jaguars. Joshua Taylor Scobee (born June 23, 1982) is an American football placekicker who is currently a free agent. He was drafted by the Jacksonville Jaguars in the fifth round of the 2004 NFL draft. He has also played for the Pittsburgh Steelers.He played college football at Louisiana Tech, setting several school records. Scobee was born in Longview, Texas. He began kicking his senior year for Longview High School. In addition to handling the kicking duties, Scobee was also the punter. He was 23 for 23 on extra points and was six for nine in the field goal category. He was well known for kicking kick-offs through the uprights. He earned first-team All-District honors as a kicker and second-team All-East Texas accolades as a punter. After agreeing to play for the Louisiana Tech University Bulldogs in Ruston, Louisiana, Scobee won the kicking job as a true freshman. He went on to set school career records, as he connected 66 of 92 field goals and 145 of 153 extra point attempts for 343 points, breaking previous marks of 64 field goals by Matt Stover (1986–89), 129 PATs and 279 points by Marty Kent (1994–97). His 343 points rank fourth in WAC annals, topped only by Jason Elam of Hawaii (395), Marshall Faulk of San Diego State (376, 1991–93) and Derek Mahoney of Fresno State (351, 1990–93). The Jacksonville Jaguars selected Scobee with the 137th overall pick in the 5th round of the 2004 NFL Draft. In 2004, Scobee led the team with 93 points after connecting with 24 of 31 field goals and 20 of 21 of his extra points. In addition, he ranked 13th in the AFC in field goal percentage and tied for third on touchbacks with 11 on 58 kickoffs. During his first five NFL seasons, he has been named AFC Special Teams Player of the Week four times. In the January 5, 2008 playoff game against the Pittsburgh Steelers, Scobee made the game winning 25 yard field goal. One week later, in the Divisional round, he converted on both of his field goal attempts, kicking a 39-yard and a 25-yard field goal. However, the Jaguars lost to the New England Patriots 31-20. In 2008, during a game against the Indianapolis Colts, Scobee hit a 51-yard field goal to give the Jaguars a 1-2 record, then one week later, he booted a 37-yarder in overtime to beat the Texans. In week 8, Scobee tied his career record with a 53-yard field goal against Cleveland. In Week 4 of the 2010 season, Scobee made a 59-yard game-winning field goal on the final play of the game to beat the Indianapolis Colts 31-28, breaking his previous record of 53 yards. It also set a new franchise record. For his performance he earned the AFC Special Teams Player of the Week award. 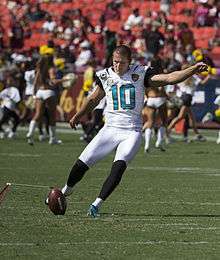 On October 24, 2011, Scobee kicked four field goals to lead Jacksonville to a 12-7 victory over the Baltimore Ravens on Monday Night Football. Three of Scobee's field goals were over 50 yards in length, including two field goals of 54 yards each. Scobee's three 50+ yard field goals tied an NFL record for most 50+ yard field goals in a single game with five other kickers including Neil Rackers, Morten Anderson, and Sebastian Janikowski. On July 16, 2012, Scobee agreed to a four-year deal with the Jacksonville Jaguars after receiving a franchise tag earlier in the year. On August 31, 2015, Scobee was traded to the Pittsburgh Steelers for a sixth-round pick in the 2016 NFL draft. He was Pittsburgh's third kicker of the preseason after Shaun Suisham and Garrett Hartley suffered season-ending injuries. Scobee made his debut in the Steelers' Week 1 game against the New England Patriots, missing his first two field goal attempts (44 and 46 yards), before scoring an extra point and two field goals (including a 44-yarder) in the Steelers' 28–21 loss. In the Steelers' Week 4 game against the Baltimore Ravens, the Steelers led 20–17 late in the fourth quarter. Scobee missed two field goals—a 49-yarder and later a 41-yarder—in the closing minutes. The Ravens then kicked a field goal to tie the game at 20, sending the game to overtime. In overtime, the Steelers declined an opportunity to let Scobee attempt a 50-yard kick to win the game on fourth-and-2 from the Ravens' 32. Instead they elected to try to convert the fourth down, and failed. Ravens kicker Justin Tucker made a 52-yard field goal on the Ravens' next drive to hand the Steelers a 23–20 overtime loss. Two days later, the Steelers released Scobee, signing Chris Boswell as his replacement. Scobee signed a one-year deal with the New Orleans Saints on March 4, 2016. Scobee was released on May 17, 2016. He is married to Melissa Scobee. In his spare time, he enjoys golfing, fishing, and hunting. 1 2 3 "Baltimore Ravens vs. Jacksonville Jaguars (October 24, 2011)". ESPN. October 24, 2011. Retrieved October 25, 2011. ↑ "Scobee get AFC honor". Jaguars.com. Oct 6, 2010. Retrieved Oct 6, 2010. ↑ "Jacksonville Jaguars sign Josh Scobee before franchise deadline". ESPN.com. ↑ Patra, Kevin (March 4, 2016). "Saints sign kicker Josh Scobee to one-year deal". nfl.com. Archived from the original on March 4, 2016. Retrieved March 4, 2016.